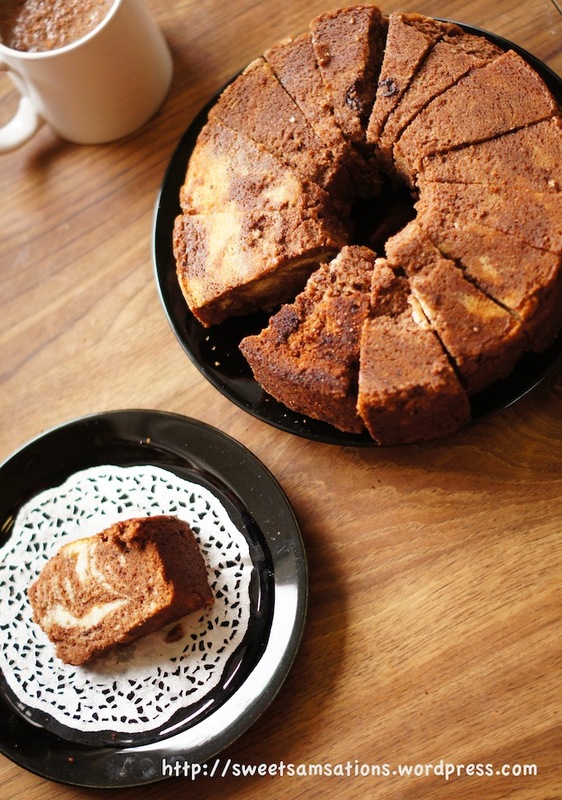 If you ever feel like a treat, pound cakes are the way to go! They’re very simple and quick to make. Also, they serve as a de-stressing therapy! I recently had to move, and I decided to commemorate my crappy ol’ oven by baking in it one last time. It was probably a really bad excuse for me to de-stress and procrastinate before accepting that I had to deal with my crazy move! I first saw this cake in my book Cake Keeper Cakes by Lauren Chattman and was drooling over it. Later, a fellow blogger, Lina of Crustabakes made the cake and testified that it was delicious! 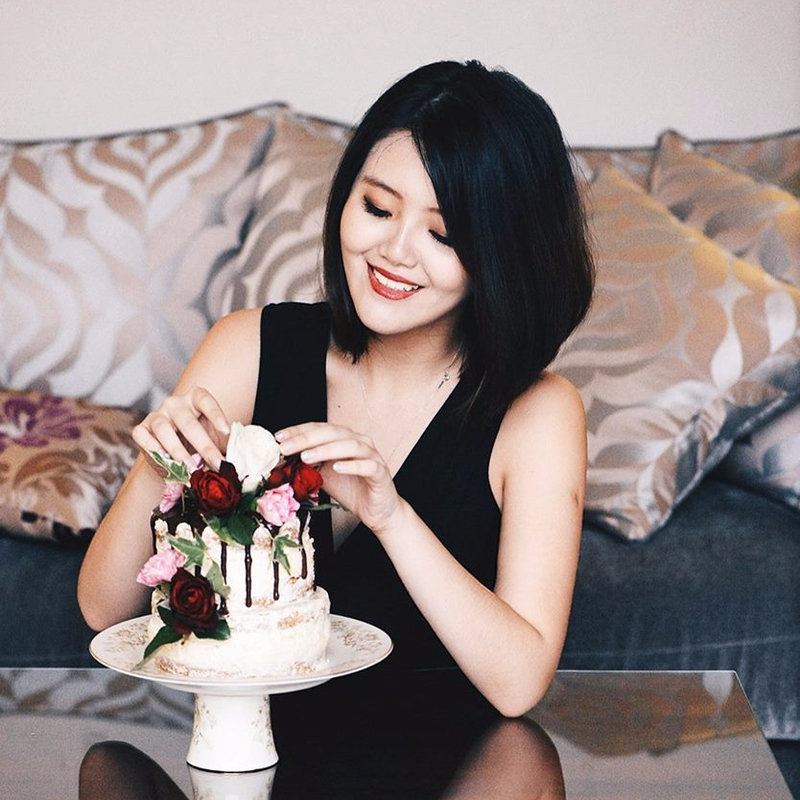 I was in love with her pretty pictures and knew that I had to some day make the cake! As soon as I stuck my pound cake in the oven, I distracted myself by cleaning out the house, and consciously prepared myself for the worst to come. Oh gosh! What have I done? I was laying a track for a disaster bound to happen! However, in the midst of my paranoia, the smell of baked nutella® started to fill my kitchen, and I knew then that the cake had to at least taste good! The top was however starting to brown after 50 minutes and so I hastily ripped off a piece of aluminium foil to cover over it. After 75 patient minutes, I brought the cake out and overturned it. Voila! It was perfect! I was so glad that the cake worked out in the end. It was soft, buttery, delicious, crumbly and nutella®-y! (new word) My friends and I absolutely enjoyed it! For the 2 days that my 2 friends and I took to clean my house, this cake became our companion. We ate it during our breaks, we ate it as a snack and we ate it when we were stressed out. Yes, S-T-R-E-S-S-E-D is D-E-S-S-E-R-T-S spelled backwards after all! Lemme tell ya, moving is no easy task, especially when you’ve been there for 5 years! It’s amazing how much junk we all collect 😦 In a sense, moving is good because it forces you to clear out garbage and sell things that you no longer need. Without further ado, let me present to you my modification of this wonderful cake! It’s a much “skinnier” version of the original, without compromising the delicious flavour of a pound cake! adapted from Cake Keeper Cakes by Lauren Chattman. Preheat the oven to 325°. You may either use a 9×5 loaf pan an lightly grease it or a non-stick Angel Food Cake pan like mine! I didn’t grease mine but it came out very easily. Combine the flour and baking powder in a medium bowl. Set aside. Beat the eggs until pale and fluffy, then combine with vanilla. Set aside. Cream the butter, margarine and sugar on medium-high speed until fluffy, about 3 minutes, scraping down the sides of the bowl as necessary. With the mixer at medium-low speed, gradually pour the egg mixture in a slow stream. Turn the mixer to low speed and add the flour mixture, 1/2 cup at a time. Mix for an additional 30 seconds. Pour the batter into a separate bowl. Mix the whipping cream and nutella® on high speed until blended together. Now combine half of the batter with the nutella® mixture and beat on medium-high speed, mixing well. Place the batter into the prepared pan by alternating spoons of “white batter” and “nutella® batter”. 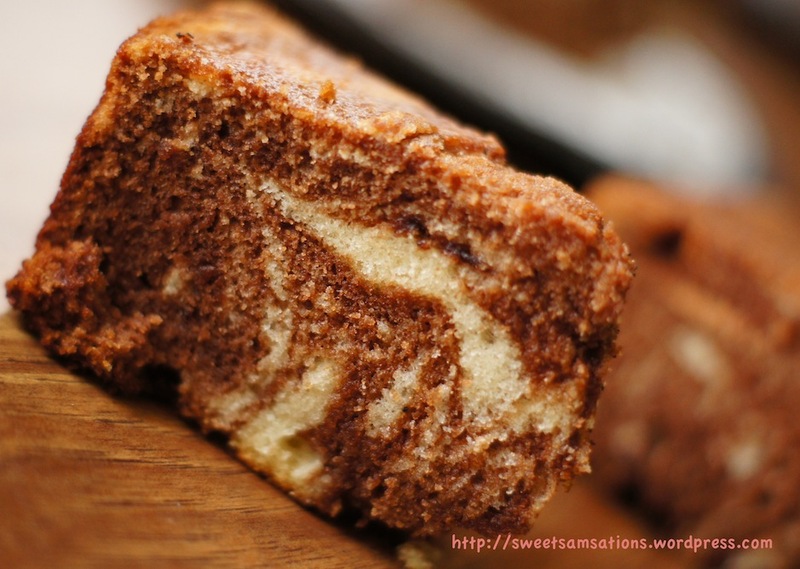 Then, with the end of a wooden spoon, gently draw swirls through the batter to marbleize it. Don’t over mix or you won’t get the marble affect. I think I actually overmixed mine a little, which is why you don’t see too much “white” in it. Bake the cake for about 1 hour and 15 minutes, until a toothpick inserted in the center comes out clean. Invert the cake onto a wire rack and let cool completely, about 2 hours. Serve! This cake is beautiful! I know what you mean about not being able to leave a recipe alone. I suffer from the same thing. Somtimes it turns out good, and other times… well, you know. This one looks fantastic though. Good luck with your move! Thanks Sarah! I’m glad the move is all done! I’ve already unpacked my crazy number of pans, ingredients and my beloved Kitchen Aid. So soon enough I’ll be able to start baking again! 😀 Hopefully this oven works better than my last! Yum, yum, Nutella, makes everything so good! 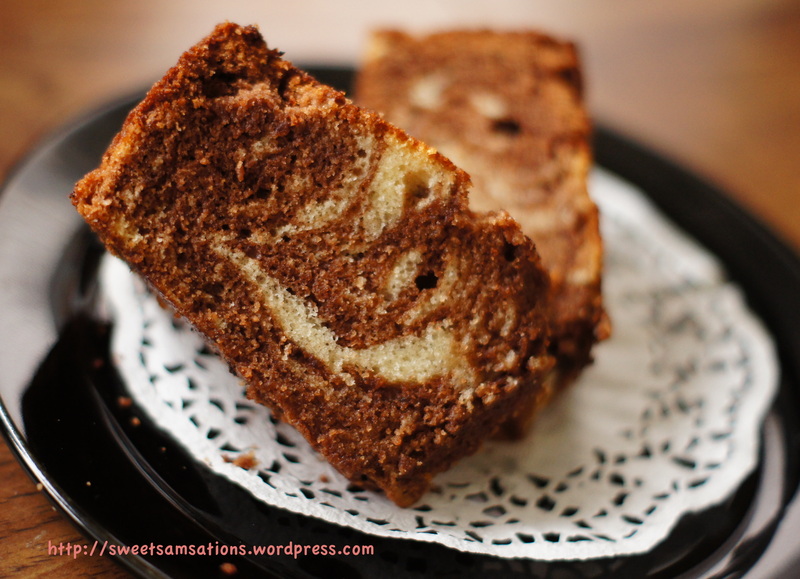 This pound cake has all of the elements for enjoying and craving the nutella fix! Mmm, I’m seeing some good nutella recipes today! Too bad my hubby has my car so I can’t go to the store right now!! Soooomeday…now we’re trying to get things in our house packed up since we’re getting ready to move ourselves! See there’s written proof that we should definitely eat desserts when we are stressed! I think you have smother winner there! Tea cakes are the best!!! exactly! It’s kinda a bad habit though! lol. I eat so much junk food whenever I’m stressed, so I try to make my desserts slightly healthier at times. haha..
You convinced me. I’m never moving. But I am making Nutella pound cake! Love poundcake! Yours looks delicious! Nutella and pound cake sounds so good. I’d love it toasted with a scoop of vanilla ice cream. oooh! That sounds like a wonderful idea!! Thanks Carol! You adjust recipes just the same way I would! Less sugar and you’ll never know the difference. Same with the Nuetella! I’m impressed that you are baking such a beauty in the mist of moving. Doesn’t it feel great to purge “stuff”? It totally does!!! It also serves as a reminder to not buy junk! I’m being very careful with my shopping these days. lol..
Oh wow! 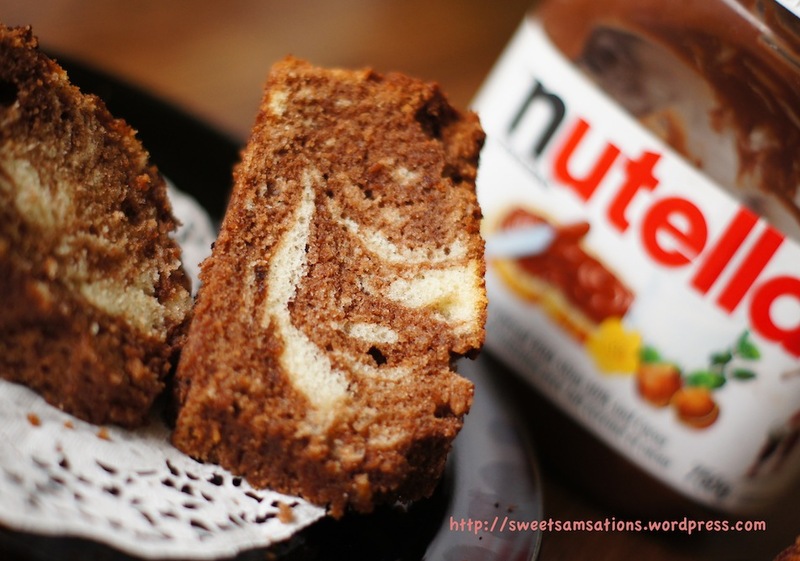 I’ve not really try a nutella pound cake yet! I would love to try this though! Looks really yummy! Thanks for sharing the recipe. Thank you!! They’re great!! Try them one day when you have half a jar of nutella about to expire. hehe.. This cake looks moist and delicious and it’s got Nutella!! hahaha! I’ve heard of people doing that people but have never dared to! It does sound quite tempting though! woohoo…. nutella! who can say no? Nutela is in a few blog posts today, and coincidentally, I’ll be picking up a jar myself to make my nephew a birthday treat! The cake looks amazing, so light and chocolatey. A very nice way to use up ingredients for your move. Good luck with the move. Nutella always makes me happy, so I know I would just adore this! I love the marbling, too! Hope you survived your move and that your new stove is happier than your old. hahaha… !! Yeah! This cake does serve as a great bribe. It was a nice encouragement for my friends who came to help me move too! I’m in the midst of making this recipe and the amount of salt to use is not listed! Help! Hi there Katterklan! Thank you for visiting my blog. You do not require any salt for my recipe. I’ve used salted butter and thus don’t need additional salt. If you are using unsalted, add 1/4 tsp salt. Hope that helps! 🙂 I see that I forgot to remove the “salt” from my instructions. Thanks for bringing this up! Thanks! I use unsalted butter so I just added a pinch. I used an angel food pan. It turned out delicious! This looks delicious and a pretty cake too! this turned out gorgeous! 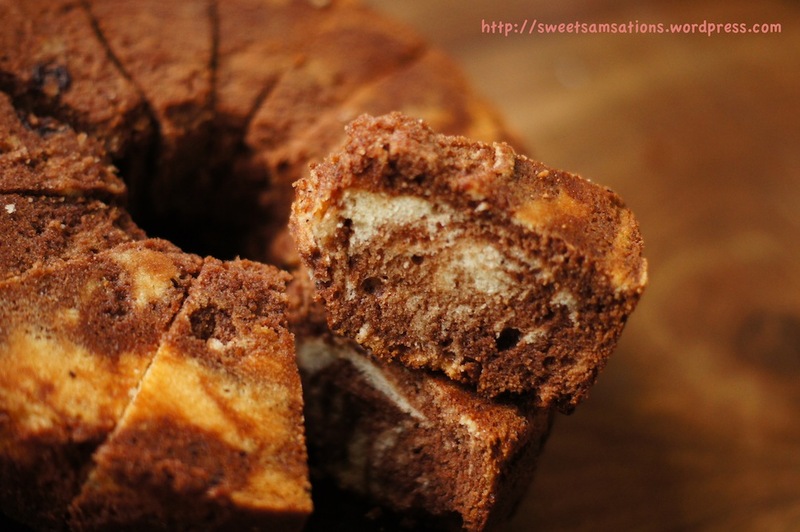 i’ve made nutella poundcake before + it was a huge hit – glad to see that yours was, too! i need to try your healthified version next time! This looks so tasty! A big slice of this with tea, how perfect! nutella®-y! coffe cake and cleaning sounds like an awesome pairing. Are you done with the move? Your cake looks so moist so sad to hear it is all gone. I think I can handle that 1 cup of nutella, it looks delicious! I just clipped two couples for $1 off Nutella. I’ll be making this recipe first! I cannot wait to make this recipe, S! I absolutely LOVE Nutella (R) and I’ve sort of forgotten about pound cakes… it’s been way to long. SO thank you for the reminder… and the inspiration. And hope you’re surviving the move- not the most fun, but you seem to have such a positive attitude 🙂 Awesome! Experimenting in the kitchen is always fun, especially when it is a success! This looks delicious-we all love Nutella, so I am sure it would bring anyone running to the table. Also, I wanted to let you know I found a recent comment of yours in my spam box-sorry for not reciprocating sooner! Enjoy the day. I just made a pound cake the other day (will be posting it soon). I love the look of yours, everything seems to be better with Nutella added to it. I will have to try this recipe next! I would like to make myseld very tiny and live in a jar of Nutella. This pound cake rocks! You are always a genius Sammy. You’ve not only lightened it up but you Nutella’d it up as well. YAY! And I couldn’t agree more that stressed is actually dessert spelled backwards. Good luck with the putting things away after the move. Maybe you need more dessert? I loveeeee pound cakes! I made a whipping cream one a few weeks ago and man it was delicious. Yours look and sound so scrumptious! Hi Natasha!! Very happy to hear that!! 🙂 I’m glad you and your household enjoyed it!! 😀 Thanks for trying my recipe! omg Alice! Happy Birthday to your daughter! I hope she really likes it!! mmm!